← The Late Great U.S.A.
For the first time in our history, Standard & Poor (S & P) announced August 5th, 2011 that it has downgraded the credit rating of the United States one notch below AAA. It said, “’political brinkmanship’ in the debate over the debt had made the U.S. government’s ability to manage its finances “’less stable, less effective and less predictable’”. The S & P also stated, that ‘politicians in Washington were becoming less able to get to grips with the country’s huge fiscal deficit and debt load’. Russia’s Prime Minister, Vladimir Putin, stated on August 1st, 2011, “They (the U.S.) are living like parasites off the global economy and their monopoly of the dollar”. He also stated, “They (the U.S.) are living beyond their means and shifting a part of the weight of their problems to the world economy”. 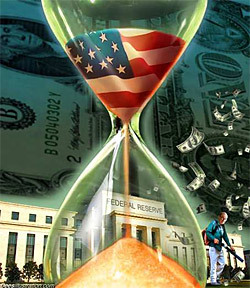 China stated on August 6th, 2011, that we, the United States, “need to cure our addiction to debt”. It also stated that we, the United States, need to, “come to terms with the painful fact that the good old days when it could just borrow its way out of messes of its own making are finally gone”. Further, “to cure its addiction to debts, the United States has to re-establish the common sense principle that one should live within its means”. And if that isn’t enough, they went on to say that “(Washington) has been spending like there’s no tomorrow … they have been irresponsible fiscally so they deserved it (the S & P downgrade)”. This is where compromise and greed have gotten us in this land of plenty. All three of the entities listed above were dead on accurate in what they had to say concerning our predicament and what has transpired to get us here. Every one of our “leaders” in Washington should be crimson faced at this entire fiasco. If they have even a smidgen of decency about them, they should be embarrassed to be seen in public. Some had an opportunity to stand their guns, so to speak, and failed miserably. Politics, immorality and greed, as with Rome in the past, is destroying the greatest nation that has ever existed in history. We started out as a self-sacrificing, Christian nation, and have spiraled downward to a selfish, satanic sewer of immorality and greed. We have been “taken to the woodshed” by two countries that would love nothing better than to destroy us. But why should they bother? We are destroying ourselves. Give us enough rope, and we will hang ourselves. Actually, the rope is already over the tree limb, and the noose is around our neck. All that is left is for someone to slap the horse on the rump, and we’re done for. Frankly folks, I don’t see that as being very far off. Here’s the sad part though. No one has done this to us. We have done it to ourselves. We vote scoundrels back in office time after time, because of our own greed and immorality. We listen to these silver-tongued orators promise us “pie in the sky”, and now we have gotten what we deserve, a rotten tomato in the face. All the blame can’t be laid on Washington though, because we the people have held our hands out for years wanting more and more, not realizing or not caring, that those in Washington cannot give unless they take from someone else. Our generation is a spoiled nation of people, who can’t live within our means even in our own lives. It is my belief that our great country must decrease in importance from the world scene, in order that the nations of the world are arranged as depicted in prophecy. This is rapidly happening right before our very eyes. Due to our own sins, we are rapidly decreasing economically, as shown above. Our dollar is on its way out globally, and will probably be replaced soon with a different world trade standard. Our economic lifestyles will also soon change in my opinion. And I hate to say it, but we probably haven’t seen anything yet with the unemployment rate that is going to befall us, possibly soon. Our dependence on oil is our Achilles heel, and could bite us hard at any time. My advice would be that we need to “get our own house in order”, not just economically, but especially spiritually. If you’re in debt, get out of debt. Live within your means. If you’re in debt to Satan, come to Jesus Christ. He is our only hope, and as the Apostle Paul says, “If in this life only we have hope in Christ, we are of all men most miserable.” (1 Corinthians 15:19) The fact is we do have hope in Christ, in this life and in the life to come, if we are in Christ and He is in us. Do not place your hope in man. There is none. There is no need to be miserable though when Jesus Christ lives within us by His Holy Spirit. Even when our earthly world is falling apart, there is always the glorious presence of Christ within us, and the expectation of His soon return. Can there possibly be any good news from this mess that we are in and spiraling deeper into? Absolutely beyond a doubt there is. Even through the sadness of seeing a once great nation destroyed by Satan’s minions, know that God is still in control. He is allowing all this to transpire, and it is fitting perfectly into His plans for the removal of His Church (Rapture) and His judgment upon this world (Tribulation), which could kick into high gear at any time. As I have repeatedly said, no one knows when the Rapture will take place, but God Himself, so I dare not guess. However, He does tell us to watch for the signs that He provides for the last days. The snatching away of the Church will occur before these signs reach their maturity, but even now we are seeing them ripen on the vine. The Rapture surely cannot be far off. If you are living in a dream world, thinking that everything is going to be okay, and certainly will get better, please come down out of the clouds. You’re living in fantasy land. We are definitely at the final stages of God’s dealing with mankind. Everything is going to get worse, and worse, and worse. Somewhere in there, Jesus is going to remove His Church and the Tribulation will start, bringing hell on earth for seven more years. We are never going back to the United States of America that once was. Get used to it. Get ready for Christ’s return. This entry was posted in Guest Commentary, Theme of the Month and tagged America, Bible Prophecy. Bookmark the permalink.